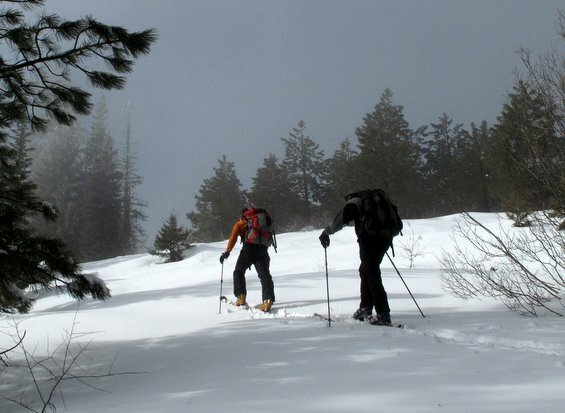 Photo Left: Gary Womeldorff and Matt Dahlgreen on new terrain leading to Old Blewett Pass. People are such odd creatures of habit. I ponder my own peculiarities in this respect while approaching Blewett Pass on a drive home from Seattle. 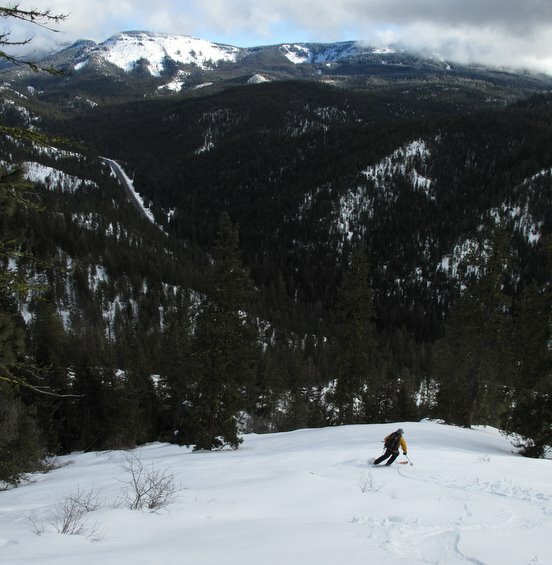 A few miles before the pass – on the sinister, Kittitas County side — I try to recall if I’ve ever skied Blewett from this side of the pass. No: I’ve always skied these environs (and here a chorus of angels might saturate the air waves) from the glorious Chelan County side. It’s an omission that has me using several pullouts near Blewett Pass to eyeball surrounding slopes…which convinces me I’ve been shortsighted. 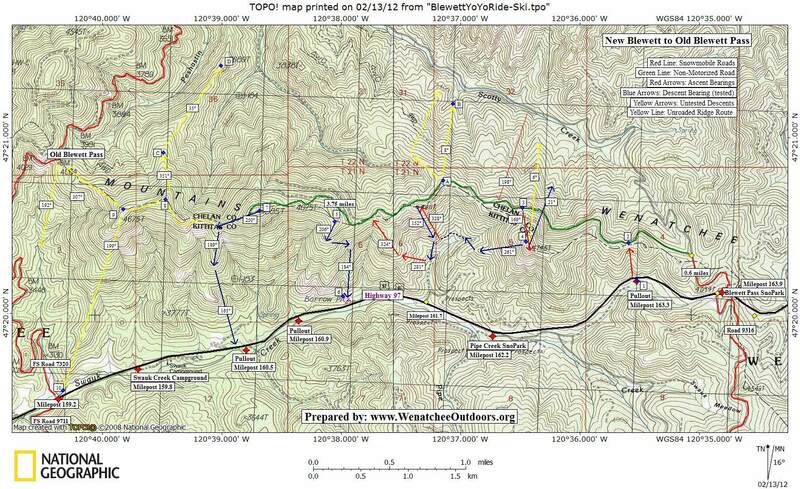 At home, maps help me decide how to string together a variety of those slopes into an interesting tour. To a few cohorts, I float the idea of traversing from New Blewett to Old Blewett the idiotic way – that is, with multiple 1500-foot plummets to enjoy the slopes flanking the highway. Two of the three halfwits contacted bite. Our exploratory tour starts a few days later two-thirds of a mile beyond (west of) Blewett Pass and uses the first plowed pullout we can snag. From the north side of the highway, we stitch a zigzag seam uphill through open forests. The forest floor is none too generously endowed with winter’s fruits: Six inches of consolidated snow constitutes the base while a few inches of fresh snow soften and plump-up the snow pack. Before long we’re on an undulating ridge crest paralleling Highway 97, known as the Wenatchee Crest , touring along the Kittitas-Chelan county border. Road 800, designated as a voluntary non-motorized route, borders the crest and we follow it westward toward Old Blewett Pass. A few snowmobiles have scoffed at the notion of a voluntary closure and have used the road but, mainly, it’s the tracks of snowshoers and cross-country skiers that are imprinted in the snow. Photo Right: Diamond Head from the Wenatchee Crest. As we shuffle west, we start launching various drops. 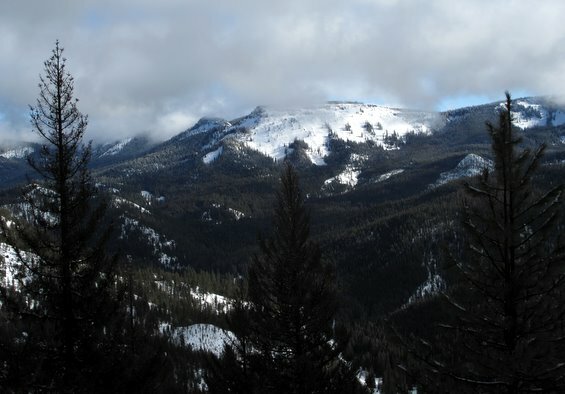 Three of our drops head south into Kittitas County along sub-ridges spiked with the orange-barked towers of ponderosa pines and peppered with the fat stumps of Douglas firs logged decades ago. The snowpack is ridiculously thin but, when the base is firm, it’s startling how much fun a nine-inch snowpack provides. Photo Left: Phat skiing on skinny snow. 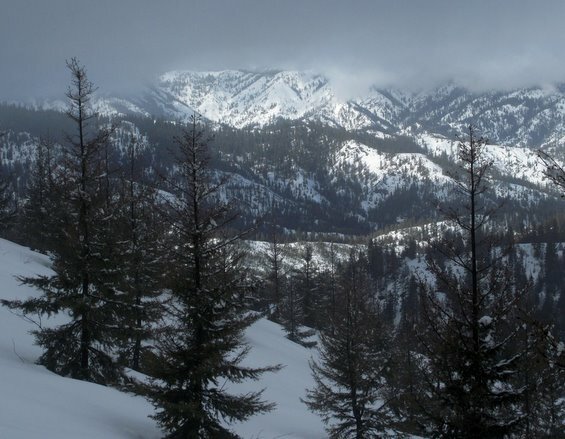 We also take one run down the north-facing slopes of Chelan County. Here the snowpack is monstrous (perhaps 20 inches deep) but the vegetation is thicker and we must hunt and peck for openings. We find reasonable skiing but these northern slopes, we decide, are trickier — the wrong choice of lines could easily choke down into a horrid Hell hole of second growth. Today, in this hollow of hills, the angels are skiing the south-facing slopes of Kittitas County. By late afternoon we are at road’s end atop Peak 4,885’ looking at Mt. Rainier to the south and the maze of hills composing the Wenatchee Mountains all around us. From this peak we had planned to follow the roadless portion of the ridge another 1.5 miles west along the county line to Old Blewett Pass, retrace a bit, and make a final drop to the highway. We lack a dash of daylight and a measure of zip to pack that all in. Instead, we follow south-facing ridges directly down to the highway. We enjoy a unrushed 1,600 vertical-foot drop through creamy snow and buttery light. Photo Right: A sliver of the Wenatchee Mountains bordering the Wenatchee Crest. One of our crew hitchhikes back to the car, several miles away to the east now, while two of us discuss the good skiing that, to date, has eluded us here. In truth I’m glad we didn’t polish off the planned route in one long push. I’m looking forward to another visit and to exploring unknown slopes. 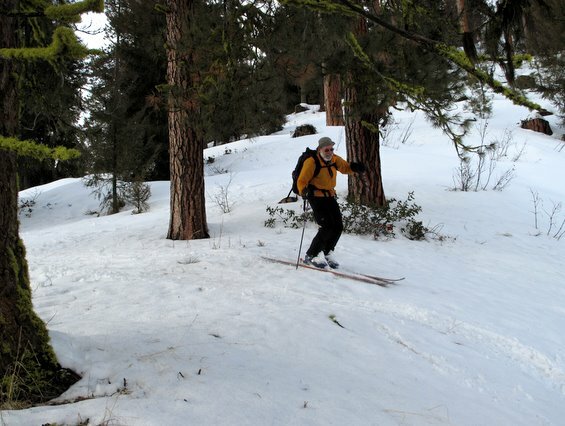 After a few more sessions here, the skiing on the neglected side of Blewett Pass just might become a habit. Photo Left: A bad new habit in the making. Nordic Skiing. The details below are aimed at backcountry skiers and snowshoers enjoying some of the off-road slopes this area offers, but cross-country skiers on lighter touring equipment will enjoy stride-and-gliding over along the ungroomed road system that parallels the county border. This high ridge system is called Wenatchee Crest. 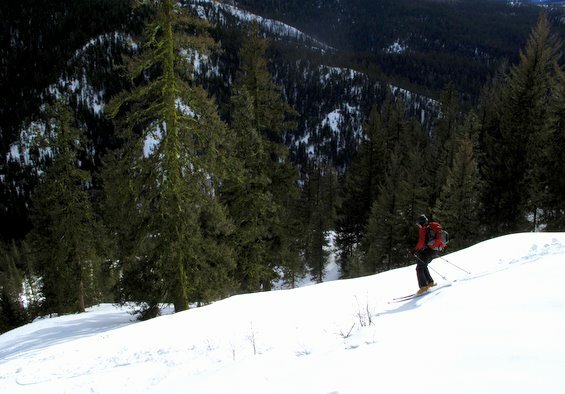 Cross-country skiers will want to park at Blewett Pass (SnoPark pass required) and follow the road leaving from the north side of Highway just west of the highest part of the pass. The first segment of road is shared use with snowmobiles. At an intersection after 0.6 miles, follow Road 800 to the left into the voluntary non-motorized area. The road carries on for another 3.75 miles until it ends near the summit of Peak 4,885’. 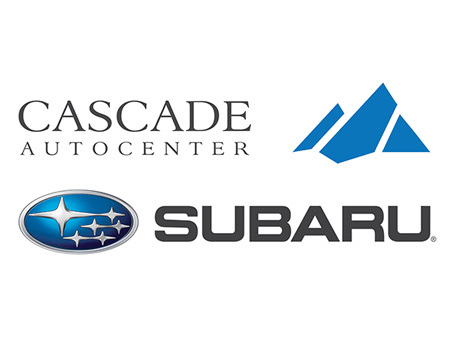 There are a few forks in the road as you follow the Wenatchee Crest but the longest and highest option is to keep taking the left fork whenever you have a choice. The setting is beautiful and reminiscent of skiing portions of the Hog Loppet . 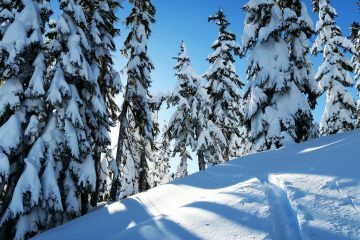 See this link for more information about Nordic skiing or snowshoeing Road 800 along the Wenatchee Crest. Activities suited to the following details: backcountry skiing, snowshoeing. Skill: 1+ to 2+ (advance beginner to intermediate). There are many choices of slopes here that can accommodate most ability levels. Good route finding and navigation are, perhaps, the greater skill required to find and enjoy good skiing. That being said, even those who are not accomplished in these skills will find this is a good place to practice because, with a just a modicum of common sense, you can’t get seriously lost. At any point along this route you only need to head south to find your way back to the highway. Fitness: 1+ to 3 (strong beginner to advanced). This area also accommodates most fitness levels. The big variable is how many downhill runs you make as you follow the county line west. You can make the tour a 1,500-vertical- foot day, or a 6,000-vertical- foot day. Access. From the Y-Junction, follow Highway 97 south to Blewett Pass. Various pullouts beyond (west of) the pass provide starting points for different tours starting on the north side of the highway. We used a pullout two-thirds of a mile past the pass at Milepost 163.3 (no permit required). Tours can also be started from Milepost 162.2 at the Pipe Creek SnoPark (SnoPark permit required), or the pullouts at Milepost 160.9 (no permit needed) or Milepost 160.5 (no permit needed). Map. See a topographic map of the area below. Trip Instructions. Use our topographic map above to navigate up to the crest, and then follow the crest west skiing some the descents shown. The red ascent and blue descent arrows on our map show terrain we explored that was open enough for good uphill travel and/or open enough for good turning on descent. All of the terrain shown with blue descent arrows would be fine for uphill travel as well. The yellow arrows on our map were not explored but satellite imagery has us believing that the south-facing terrain will be good . We are less confident about the vegetation on the yellow-arrowed north-facing routes – it’s open enough to appear promising but not so open to be a slam dunk. Return. This tour was done in a one-way direction — at tour’s end one member of our group hitched a ride back to our car. Many possibilities exist here, however. For, example Road 800 can be retraced to line up for a final descent to the car. Or rather than traversing in one direction, park at the Milepost 160.5 pullout and use the nearby ridge systems to design a circular tour. Hazards. Some slopes off of the ridge crest could slide in the wrong snow conditions. However, because the area receives modest amounts of snow and because many of the sub-ridges leading up to the main crest are gentle, this area offers many safe touring options. Keep it in mind as a possible option when avalanche hazard is high elsewhere around the region. 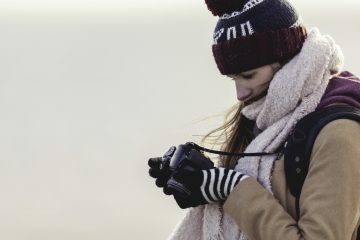 Trip Reporter/ Date: Andy Dappen, February 14, 2012.